About: Gonzalo Borondo was born in Valladolid, Spain in 1989 but he grow-up in Segovia. At fourteen, Borondo moved to Madrid where he attended the Art School, the Academy of Fine Arts and where he began experimenting with graffiti around the city. In 2012, he spent some time in Rome, Italy for an Erasmus cultural exchange program at Accademia di Belle Arti di Roma where he had the opportunity to learn new techniques. He worked with charcoal, oil and tempera, and experimented with new ways of expression, eventually understanding that the best gallery for him – is the street. His father was a restorer, Gonzalo grew-up surrounded by classical paintings, that have shaped its final taste. His tormented characters that first decorated the walls of Rome and Madrid gained him international recognition. Today, his murals utilize sweeping, expressive brushstrokes that demonstrate little restraint. Borondo is unafraid of dripping paint, thickly stabbing earth tone hues on walls for his contemplative portraiture. He is reinventing street art by using an original method of “glass scratching,” inspired loosely by the recent economic crisis. Borondo prefers large sizes, due to the greater sense of freedom. His truth laden aesthetic takes its influence from the great Spanish master, Francisco Goya. Like Goya, Borondo emphasizes meaning behind the art. Borondo aims to create something far from the Pop Movement and its codes. His characters have a ghostly quality, they are present without being overbearing, and merging with their environment perfectly. Where you can see it: New Delhi, Las Vegas, San Francisco, Atlanta, Miami, Rome, Milan, Segovia, Madrid, Barcelona, Fanzara, Paris, Lisbon, Istanbul, London, Copenhagen, São Paulo, to mention a few. 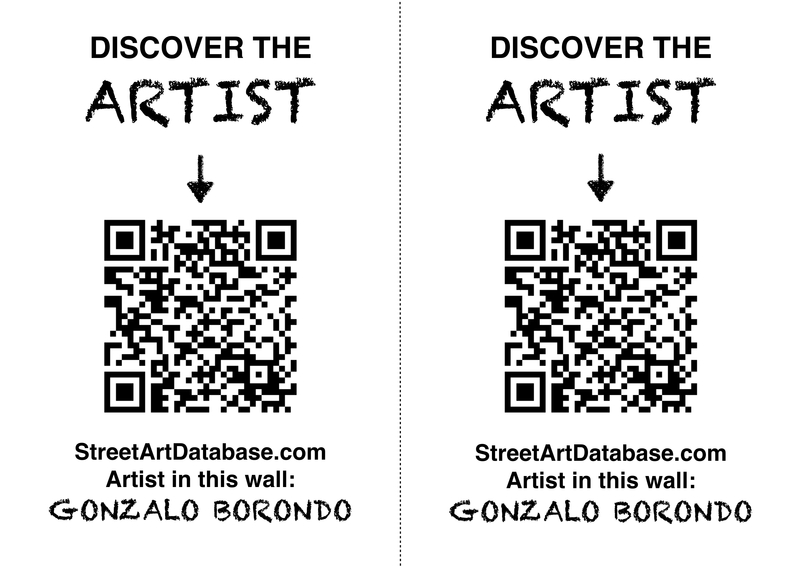 PRINT CODE: help tagging Gonzalo Borondo in the streets of your city!